Roger Ebert hates 3-D, and Avatar gave me a headache. But it’s the hottest video trend in 2010 and likely 2011. Scores of movies (including good ones, like Toy Story 3) are leading the way in the high-end bracket, but 3-D televisions are starting to trickle down to the masses, and Nintendo’s 3DS might be the first massively successful 3-D gadget on the market. It remains to be seen if anyone actually wants 3-D in their home, but there are going to be lots of ways to do it regardless. That’s where Panasonic’s new camcorder comes in. 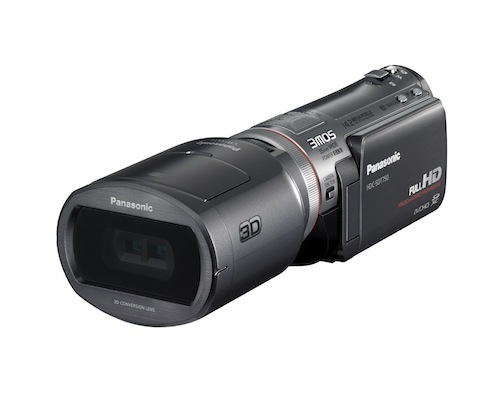 The camcorder is very important and innovative, so Panasonic gave it a catchy, easy-to-remember name: the HDC-SDT750. (Panasonic’s naming strategy is a cat named Steve who stomps on the keyboard of a Panasonic engineer.) The camera is billed as the world’s first consumer 3-D camcorder. The camera is essentially an older 3MOS camcorder with a 3-D attachment that can actually be removed for standard 2-D video–a nice touch, since you won’t want all of your video in 3-D. It uses a 3MOS sensor system, rated at 7.59 motion megapixels, and can accurately capture 5.1 surround sound with five discreen microphones scattered throughout the casing. It also sports a 3-inch touchscreen for navigation. Video is recorded in AVCHD format, at 1080p resolution and 60fps. That attachment records both right-eye and left-eye images simultaneously, both at 1080p resolution. When shooting in normal 2-D, it’s got all the amenities you’d want–face recognition, Hybrid O.I.S. image stabilization, that kind of thing. Panasonic specifically names its own Viera line of 3-D televisions as being compatible. It’s not clear if other 3-D TVs from makers like Sony would also be able to correctly play back 3-D video taken with the camcorder. The Panasonic HDC-SDT750 will be available in October on Panasonic’s site with a suggested price of $1,399. That’s expensive, sure, but it’s the first of its kind–nobody ever said being an early adopter would be cheap.